Get ready for a new breed of wireless web gadgets - if you live in the US at least. FCC chairman Kevin Martin wants to allow Microsoft and Google to develop new wireless web gadgets to use the spectrum freed up by the switch-off of analogue TV services in the USA next February. The 'white space' has been at the centre of a controversy between the internet companies, who want the frequencies to be available unlicensed for use by mobile devices, and traditional broadcasters and phone networks, who fear either competition or interference from the new services. The CBS and ABC networks saying the new devices could freeze screens of viewers watching new digital TV broadcasts. Sporting bodies and theatres also oppose deregulation, claiming that web gadgets might also interfere with the wireless microphones they already use. The Federal Communications Commission will make a decision on November 4 (coincidentally, election day) but Martin's announcement yesterday that he was minded to allow unlicensed devices, as long as they include anti-interference technology, clears the way for high-speed wireless web gadgets. 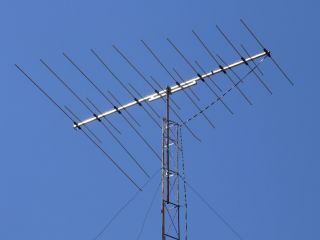 Unlike the UK's staggered analogue switch-off, the whole of America will switch from analogue to digital television on a single day: February 17, 2009. Consumer organisations estimate that up to 19 million Americans still haven't taken the action (buy a digital convertor box or switch to cable TV) they need to avoid waking up to blank screens on February 18.